June 12, 2015 – Four abandoned puppies escaped certain death courtesy of living space at Fort Valley State University’s State Animal Facility for Emergencies (SAFE) Center. Dr. George McCommon, director of the SAFE Center, said the Macon-Bibb Animal Shelter was recently filled to capacity. When the shelter becomes full, animals are euthanized. 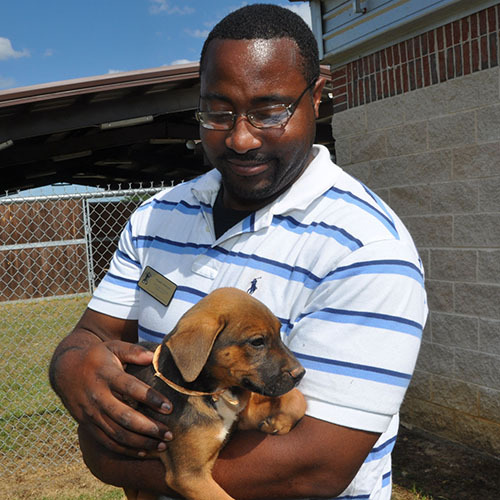 FVSU rescued the abandoned puppies by transferring the animals to the SAFE Center on May 18. FVSU’s SAFE Center is a 7,800 square-foot facility funded and built by the state of Georgia. The facility can house 105 dogs, 80 cats and 30 horses in the event of natural or man-made disasters. The center which opened its doors in 2012 also serves as a hands-on classroom for veterinary science students enrolled at FVSU. During their stay, the puppies received vaccinations and heartworm tests. After receiving care on May 26, the puppies traveled to Colorado where an animal rescue group will oversee adoptions to new homes. McCommon, who also serves as head of FVSU’s Department of Veterinary Sciences and Public Health, said other animal welfare agencies and shelters in the middle Georgia area, including those in Monroe and Jones Counties, have used the SAFE Center. “We are not a warehouse, but we are a place that’s available for community organizations to use to help protect animals and people alike,” McCommon said. The director said that in early May, faculty, staff and students traveled to the animal shelter in Macon to conduct vaccinations and heartworm tests on 51 dogs and seven cats slated for local adoption. The FVSU professor said the medical treatments are made possible due to funding from a U.S. Department of Agriculture grant. For more information about the SAFE Center and its use, contact FVSU’s Department of Veterinary Sciences and Public Health at (478) 825-6424 or visit ag.fvsu.edu.